The Angara-Baikal territorial department of Rosrybolovstva filed a case on administrative violation of the pollution of the Angara River with oil products in Irkutsk, the press service said. According to the ministry, an emergency spill of oil products on the Angara ice occurred last week in Irkutsk on Polyarnaya Street, near the oil depot of Irkutsknefteprodukt JSC and the gas station of Rosneft Oil Company. The area of ​​pollution exceeds 250 square meters. “The oil tank farm operates in a regular mode, there are no facts of leakage or oil spills. The spill is connected with the ingress of historically contaminated groundwater into the Angara River, “the report said. The cause and circumstances of the incident are not called. A case of an administrative offense has been initiated. According to the press service, by the time the employees of the Angara-Baikal regional administration of Rosrybolovstvo conducted a full-scale survey of the water area, the water protection zone and the coastal protection zone of the Angara in the place of the spill. In addition, experts of the Baikal branch of the Glavrybvod FGBU Rosrybolovstva are working to determine the amount of pollution and calculation of possible damage to the aquatic bioresources of the Angara. JSC “Irkutsknefteprodukt” under the supervision of specialists of the Ministry of Emergency Situations is working to eliminate pollution, pumping out oil products, collecting and exporting contaminated snow and ice. 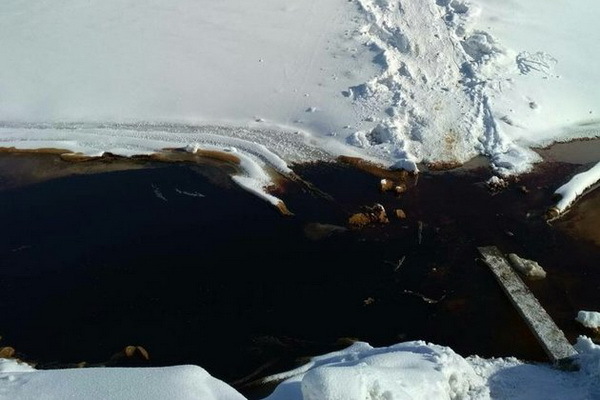 Earlier it was reported that on February 14, residents of Irkutsk discovered an “oil lake” on the ice of the Angara River near a tank farm in the urban village of Zhilkino, which has been operating since the 1930s. It is currently operated by JSC Irkutsknefteprodukt (part of Rosneft Oil Company). Representatives of the regional department of Rosprirodnadzor and the Baikal interregional environmental prosecutor’s office visited the site and confirmed the fact of pollution. The press service of Irkutsknefteprodukt reported that the Zhilkinsky tank farm operates in its regular mode, there are no facts of leakage or oil spills.